7.4 x 5.9 x 12.1 in. For an active on-the-go lifestyle! Your coffee is brewed directly into the 16-ounce thermal mug and keeps your coffee hot. Cleanup is a cinch. No more paper filters, saving you money and the environment. Brew two ways for the ultimate convenience. 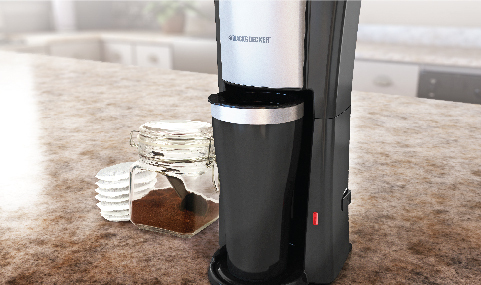 This model handles both ground coffee and pre-packed coffee pods for the brew that you want. Single Serve Coffeemaker, Black is rated 3.5 out of 5 by 62. Rated 2 out of 5 by Jst321 from Not what I expected I just purchased this and have had 2 problems. The first being that the xup came without a lid. Not a huge problem but inconvenient. Second, it never brews an entire cup. It continuously shuts off after brewing barely any water. I have went through 2 cycles of water and have to press the start multiple times for it to brew the entire cup that it came with. It is not efficient, and not what i expected. Rated 1 out of 5 by brittneymke4 from Water Drained Straight Through the Unit I’m so disappointed. I got this for my fiancée for Christmas and the first time he went to use it, the water drained almost immediately through the bottom of the unit. We tried troubleshooting to see what we were doing wrong but it is definitely the machine. We can see straight through the reservoir through the bottom, why is there hole in our reservoir?!!? Ridiculous, so disappointed. Rated 1 out of 5 by jquin1 from Coffee all over... I bought it a month ago, problem is every time I use it coffee grounds end up all over the place. It doesn't matter what kind of coffee I use whether course or fine ground, it ends up flowing all over the inside of coffee maker and in coffee mug. Very, very unsatisfactory results. Coffee filter needs a filter basket cover. Rated 5 out of 5 by Nema62 from Perfect for me I love the size. I love the reusable filter - better for the environment than those horrid pods. I love that I can put the filter, filter holder & cup in the dishwasher and I love that I can make a fresh cup every time. I prefer to use my contigo cup and go. I am on my second machine in about 10-15 years (I am terrible with dates) and hope they never stop making this product. Rated 2 out of 5 by Lkfaraway from Single serve coffee maker This sprays grounds all over the inside every time i use it. Made sure my coffee wasnt too finely ground. Still does this. I previously purchased and returned a more expensive brand...it did the same thing!! Suggestions anyone? Rated 3 out of 5 by Stormy from what kind of pods I live in Canada and so far havent been able to find any pods to work so I just use regular coffee. Might as well make a whole pot. Rated 5 out of 5 by LadyDi72 from Awesome Love the new design, but wish mug would keep coffee hotter longer. Which pods can be used in this machine? Could I take this camping and use a 120v inverter in my car to make a cup or 2 each day for 3-4 days or will it fry something? what is the max height for travel mug to fit the Model: CM618 why no clearance heights posted in the spec or description sheet? The brew and go coffee maker only brews one half cup of coffee and turns off, making only one half cup of coffee. Why?? Where can the pods be purchased. I&rsquo;ve checked Walmart and Harvey&rsquo;s in my town and they don&rsquo;t carry them. Where can I purchase a replacement permanent filter basket?